Cooked sliced chicken breast fillets in a sweet and smoky barbecue marinade. 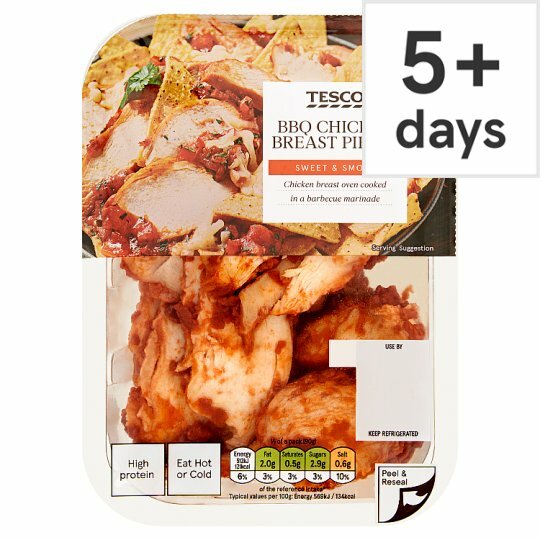 Chicken Breast (81%), Sugar, Cornflour, Rapeseed Oil, Tomato Powder, Spices, Salt, Garlic Powder, Rice Flour, Onion Powder, Potato Starch, Maize Starch, Stabiliser (Sodium Triphosphate), Dextrose, Vinegar, Smoked Salt, Chilli, Cumin, Oregano, Caramelised Sugar Syrup, Yeast Extract, Water, Tamarind Concentrate, Concentrated Lemon Juice. 800W/900W 1 min 30 sec. Place on a microwaveable plate. Heat on full power for 1 minute 30 seconds. Leave to stand for 1 minute after heating.